Sting | News | Sting: Back To Bass Fall Tour 2012 – Fan Club Presale For Bangkok Concert! 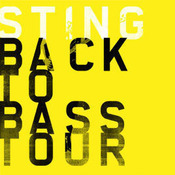 Sting: Back To Bass Fall Tour 2012 – Fan Club Presale For Bangkok Concert! As previously announced, Sting will perform at the Impact Arena in Bangkok, Thailand on Wednesday, December 12, 2012! The Fan Club presales for Sting.com members will begin Friday, October 12 at 6AM (local time). Tickets for this performance will go on sale beginning Saturday, October 13 at 10AM (local time). For this concert, Sting will be joined by a 5-piece band featuring Dominic Miller (guitarist), Vinnie Colaiuta (drums), David Sancious (keyboards), Peter Tickell (electric fiddle), and Jo Lawry (vocals). The complete Back to Bass Fall Tour 2012 itinerary is now available on the tour page . Check it out and be sure to let us know in the comments which concert you're attending! If you are a member of Sting.com and would like to participate in the pre-sale, instructions will be located on the tour page. If you are not a member of Sting.com but would like to join and participate in the pre-sales and other Sting.com membership benefits, here are the membership details.